This is an extract from a formal complaint I made to the ABC concerning misleading information presented by “The Science Show”. It was rejected by the ABC and by the ACMA on the grounds that there is no requirement that the Science show be accurate, that the claims were opinion rather than objective facts, and that balance was achieved on other programmes such as “current affairs”. Comment: Oh really? Please study these rainfall graphs published by our BOM. See footnote  concerning the extent of the Murray-Darling Basin. Or, how about this first photo: “Dry river bed of the Murray river at Myall near Kerang, Victoria, 1914. During the Federation drought it stopped flowing for about 6 months.” Or, secondly, at Mildura; camels crossing. Nowadays of course, this is the realm of houseboats, and summer deaths in boating and water sports reportedly exceed those on the roads in the region. 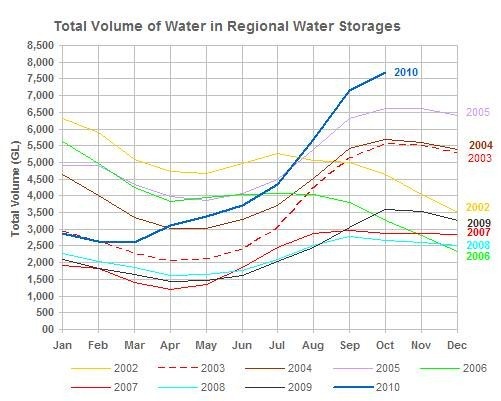 The following graph is currently showing improved Victorian regional water reserves in the past eight years through to end of October 2010. That was before the big rains and floods in November-December. Melbourne storages are also at the highest level in 5 years. I'm a retired mechanical engineer, and I guess that because in my science, any bad assumptions can get people killed, I have an abhorrence of many things that are perpetrated by academics in some areas of science. In the case of so-called climate science, the culture and bias in some media is also repugnant to me. I'm hoping that the ABC will improve its self regulating policies and culture to eliminate bias, and this website is under development towards that end. (if necessary). ABC radio’s so-called “Science Show”: licence to mislead the public.